The Global Antibiotics Partnering Terms and Agreements 2010 to 2018 report provides an understanding and access to the antibiotics partnering deals and agreements entered into by the worlds leading healthcare companies. The Global Antibiotics Partnering Terms and Agreements report provides an understanding and access to the antibiotics partnering deals and agreements entered into by the worlds leading healthcare companies. The report provides a detailed understanding and analysis of how and why companies enter antibiotics partnering deals. The majority of deals are early development stage whereby the licensee obtains a right or an option right to license the licensors antibiotics technology or product candidates. These deals tend to be multicomponent, starting with collaborative R&D, and commercialization of outcomes. This report contains over 200 links to online copies of actual antibiotics deals and contract documents as submitted to the Securities Exchange Commission by companies and their partners. Contract documents provide the answers to numerous questions about a prospective partner’s flexibility on a wide range of important issues, many of which will have a significant impact on each party’s ability to derive value from the deal. The initial chapters of this report provide an orientation of antibiotics dealmaking and business activities. Chapter 1 provides an introduction to the report, whilst chapter 2 provides an overview of the trends in antibiotics dealmaking since 2010, including details of average headline, upfront, milestone and royalty terms. Chapter 3 provides a review of the leading antibiotics deals since 2010. Deals are listed by headline value, signed by big pharma, most active antibiotics dealmaking companies. Where the deal has an agreement contract published at the SEC a link provides online access to the contract. Chapter 4 provides a comprehensive listing of the top 25 most active companies in antibiotics dealmaking with a brief summary followed by a comprehensive listing of antibiotics deals, as well as contract documents available in the public domain. Where available, each deal title links via Weblink to an online version of the actual contract document, providing easy access to each contract document on demand. 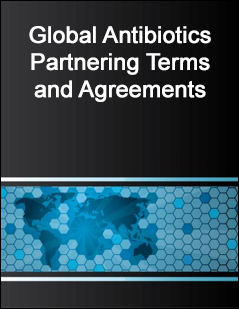 Chapter 5 provides a comprehensive and detailed review of antibiotics partnering deals signed and announced since Jan 2010, where a contract document is available in the public domain. The chapter is organized by company A-Z, deal type (collaborative R&D, co-promotion, licensing etc), and specific therapy focus. Each deal title links via Weblink to an online version of the deal record and where available, the contract document, providing easy access to each contract document on demand. Chapter 7 provides a comprehensive and detailed review of antibiotics partnering deals signed and announced since Jan 2010. The chapter is organized by specific antibiotics technology type in focus. Each deal title links via Weblink to an online version of the deal record and where available, the contract document, providing easy access to each contract document on demand. In addition, a comprehensive appendix is provided organized by antibiotics partnering company A-Z, deal type definitions and antibiotics partnering agreements example. Each deal title links via Weblink to an online version of the deal record and where available, the contract document, providing easy access to each contract document on demand. The report also includes numerous tables and figures that illustrate the trends and activities in antibiotics partnering and dealmaking since 2010. In conclusion, this report provides everything a prospective dealmaker needs to know about partnering in the research, development and commercialization of antibiotics technologies and products. Global Antibiotics Partnering Terms and Agreements 2010 to 2018 is intended to provide the reader with an in-depth understanding and access to antibiotics trends and structure of deals entered into by leading companies worldwide.